Food storage comes with a multitude of storage preparation options to keep food fresh; you’d be surprised by the all the different ways there are to prepare and store product. That’s one of the reasons we really like cold storage – lots of science goes into it. Something cool one of our clients is doing involves the science of High Pressure Pasteurization (HPP). On a recent visit to Liberty Cold, an Open Sky Group client, we got to see cool storage preparation in action with a Hyperbaric 525. Liberty Cold, located in Bolingbrook, IL is extremely committed to food safety and has installed this new machine in its warehouse. 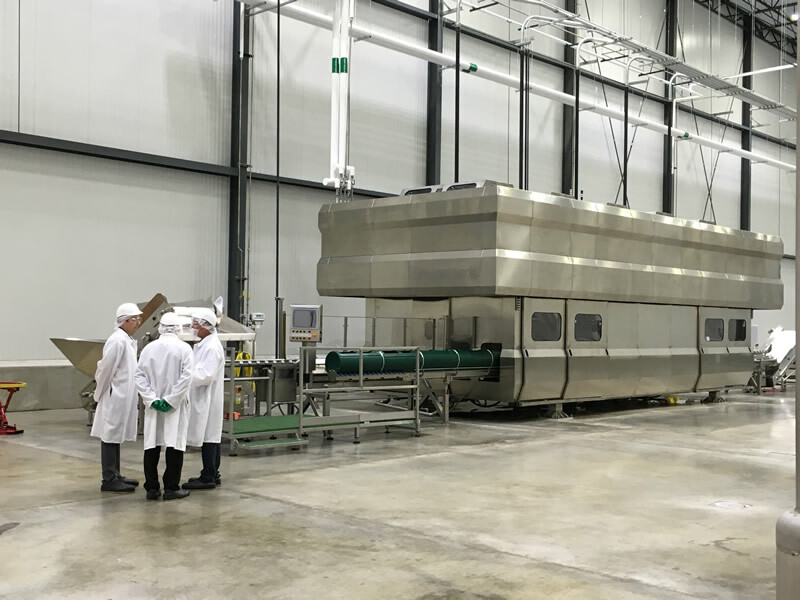 The Hyperbaric 525 performs High Pressure Pasteurization (HPP), essentially inactivating micro-organisms and enzymes in meat using extremely high pressure; up to 87,000 psi to be exact. Meat products go in, water moves in and is put under pressure for three minutes (well, actually, you can’t pressurize water but it can be under pressure with the use of air, so the air in the machine is pressurized). This is known as Pascalization, named after Blaise Pascal, a scientist that understood pressure and its effects on fluids in the 1600’s. For more information about HPP, visit Hiperbaric. So what’s the result of the HPP process on meat? You get meat that is safer and has a longer shelf life – the kind you’d find pre-packaged in a grocery store such as deli ham or turkey. The process does not impact the flavor or nutrients because the HPP does not increase the temperature of the food during the process. What else is an HPP machine capable of processing? This type of machine can process seafood, fruit, dairy products, infant food and even some cosmetics. For Liberty Cold, its intended use is for food products that will stay in the facility before going into distribution. Why put an HPP machine in a distribution center? While not the first company to put an HPP machine in a warehouse, Liberty Cold is one of the first. The idea is to offer this service to those companies who might not have a high enough volume to justify a machine themselves but could benefit from the use of that and the warehouse and distribution capabilities of a company like Liberty Cold. Click here to learn more about Liberty Cold and its HPP machine. Using any interesting or unique machines or your facility? We’d love to hear about it – email us with your story. Next Post: JDA Warehouse Management 9.1 is Ready Now - Are You?